can be one of the single most valuable assets a business can have. " their health increased their productivity by 10%"
"Laura is a consummate professional and absolutely knows her stuff. for Pinsent Masons in Scotland was a favourite amongst the delegates. 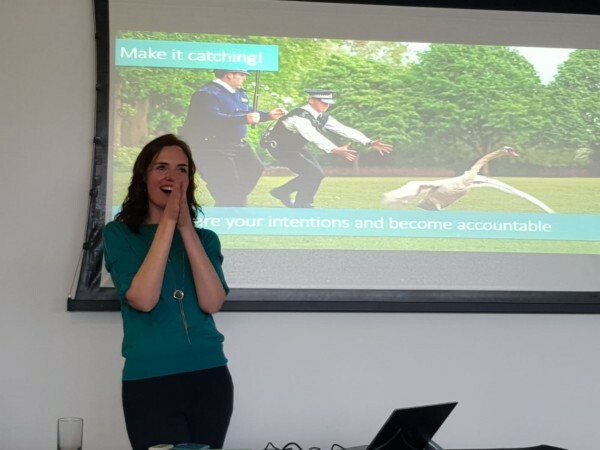 "Laura delivered a really engaging and informative presentation to our staff. lecturing resulting in lots of questions and audience participation. usual biscuits so it was impactful too!" Are you looking at your employee wellbeing strategies for this year and beyond? Nutrition forms a key strand of employee physical and mental health, supporting you to build a healthy and resilient workforce that are engaged and productive. Laura offers 3 options to complement your needs. Spark discussion, motivate and inspire your workforce to think differently about their nutrition and health to enhance their productivity. We are making over 200 food related decisions a day, 95% of which are subconscious. In a fast -paced work environment what and how we choose to eat is often not the priority and yet it has the potential to have a profound effect on our working day and overall wellbeing. Including the popular eating personality quiz, these talks offers greater insight and a different perspective on our eating habits together with practical advice and nutrition tips to energise and direct employees towards making changes that positively impact their working day. A workshop allows for a more in depth look at the emotive subject of nutrition. With time to put nutritional science in the spot light and explore some facts and fiction around elements of nutrition that directly relate to our well-being, performance and mental resilience in the workplace. A bespoke feel really adds value; tailored to your business and its particular challenges together with local information on top food choices and eateries. Incorporating the eating Personalities quiz the workshop gives greater insight and perspective into our daily habits and creates a true path for realistic diet and lifestyle change that can benefit the employer and their organisation greatly. 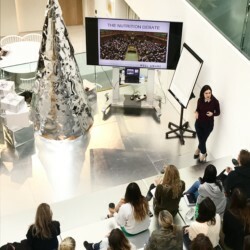 “Laura provided two interactive and informative specialist nutrition advice workshops at our UK HQ in Kings Cross. We had over 80 people attend across three sessions on the day and the feedback we received, from all colleagues including senior management was very positive and appreciative in engaging with staff. Laura also took a step further by customising the presentation to be more focused to our line of business, considered the food choices in and around our location, the environment in which we operate and the challenges we have in order to help us get maximum energy to get through the working day. Senior management particularly enjoyed the tailored company slogans to provide a clever play on health eating!. What nutrients matter for mental and physical resilience and how should we eat them? The ‘snackification’ trend and using it to your advantage. Exploring on-the-go eating and top choices to fuel productivity. Hydration – what, when, how? Our eating personalities – yes there is such a thing! With tips and ideas tailored to them. Making habits stick – exploring the challenges and sharing techniques proven to help. The talks and workshops offer something for everyone and are designed to tap into different personalities and challenges around food. For specific dietary needs related to health conditions personalised advice is important and really valued by the people I see. Dietitians’ are the only nutrition professionals trained to do this. Upgrade your wellbeing offering by facilitating individualised advice and support through mini dietitian consultations provided during the working day. Give employees the opportunity to tap into dietetic expertise within the workplace through mini consultations. Significant numbers of employees live with conditions, whose symptoms impact their working day and making time to attend appointments is often a barrier. In an age of convenience, path the way for change with evidence based dietary advice delivered to the desk in a friendly and informative manner. This can have a positive impact on both mental and physical health and pave the way for longer term changes which can be of benefit to both the business and its employees. 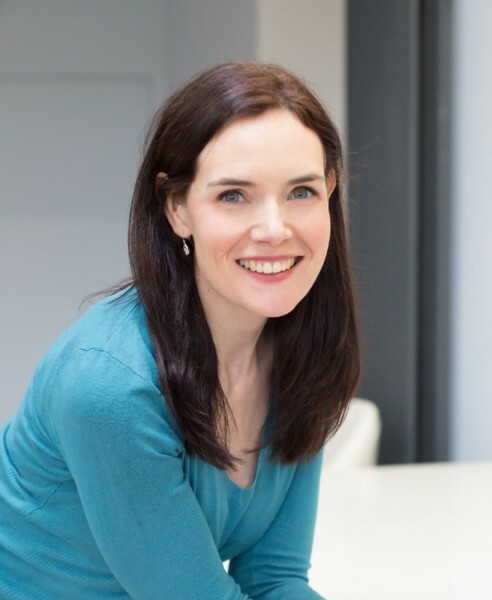 Usual length: Bespoke packages can be created to suit your teams and their working day to include a combination of talks and one to one sessions. Contact Laura to discuss your individual needs. “Laura, of LEC Nutrition, was absolutely fantastic when she came into our workplace last week. We had a full day, with 2 presentations and a number of 1-1 meetings with the team to advise on healthy eating, and specific questions relating to individuals’ eating patterns. LEC Nutrition is the private practice of Laura Clark, Registered Dietitian and Sports Nutritionist. Through consultations and other nutrition services Laura educates, motivates and inspires people to lead healthy, balanced lives.